I want to make RDF data more developer-friendly. When you show a typical developer RDF, where they have previously been used to simple JSON or XML structures, they find the format confusing, and hard to code with. This is primarily because the data is a graph, and graphs don’t fit well with the tree structures of JSON and XML. I have seen this problem tackled through the use of libraries that can parse and interpret the graph data, and present an easier interface to the developer. Whilst these have been useful, I still think there are some fundamental problems. JSON-LD also offers a solution to this problem, but is not sufficiently lightweight for environments where data structures change and develop regularly. I compare my approach with JSON-LD at the end of the post. The problems described below are based on a particular problem I am trying to solve: I want to build developer-friendly APIs over data modelled as RDF, and obtained using SPARQL CONSTRUCT queries. <uri:x> foaf:name "Bob Smith" . Then it’s obvious what X is. <uri:maybeX> foaf:name "Bob Smith" . <uri:alsoMaybeX> foaf:name "Jane Smith" . In this example, I have no idea what X is. This problem is usually solved using a heuristic, such as “the only resource of type T”. But these heuristics can be brittle, and changes to API data could easily break the heuristic. If I call an API to get a list of things, then there is no commonly understood way to indicate the order of those things. The problem with general approaches to ordering in RDF, is that they don’t clearly indicate that the list specifically refers to the ordering of the API response. An API response is typically a dynamic ordering based on the current data, rather than an intrinsic ordering such as the ordering of events. An example would be “Page 4 of all Team GB athletes, ordered by surname, then first name”. In this example, the ordering is dynamic, and only known after the query data has been returned. <uri:a> foaf:name "Person 1 in list" . <uri:b> foaf:name "Person 2 in list" . <uri:c> foaf:name "Person 3 in list" . The additional tree ontology data above can be easily inserted into API responses by adding additional triples to the top of a SPARQL CONSTRUCT query. Using the information from the tree ontology, it is possible to build developer friendly serialisations of the RDF data that are more directly usable for typical use-cases such as building tabular HTML or other visual representations of the data. The following two examples show JSON RDF Tree serialisations of Olympics data, applying the rules above. 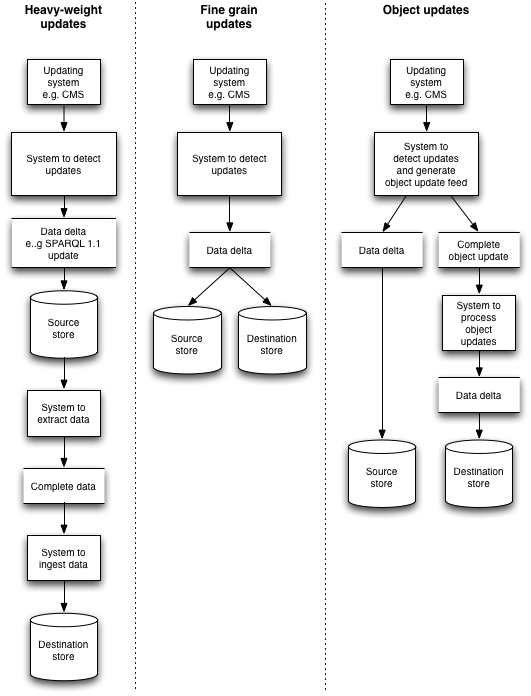 The original Turtle data is shown, along with the resultant, proposed RDF Tree serialisation. The ‘^’ symbol is used to represent triples followed in the inverse direction of the predicate. Note the repeating country nodes: these are useful for tabular representations. I have written a library to perform RDF to RDF Tree conversion, and I am looking for feedback on the syntax and general approach before I finalise the details. The design of RDF Tree is intended to be lossless, from an information perspective, but to maximise practical use by developers. RDF Tree is focused on developer simplicity: this includes the creators and consumers of APIs. An example of this would be the decision to continue to use prefixes for predicates. This makes the data easy to produce, and avoid the complexities of ‘contextualisation’ of shorter predicate names. RDF Tree is not intended to be re-used as RDF data. APIs that produce RDF Tree would need to also produce RDF. Those interested in tree-like or tabular data would use RDF Tree, those interested in the graph data would use the RDF. As the ontology structures and SPARQL queries change, little or no maintenance is required to continue to support predictable response data. Essentially the CUD of CRUD. where the R is covered by SPARQL SELECT, DESCRIBE, CONSTRUCT and ASK. The additional complexity of clearly defining the shape of a ‘thing’, I think, explain why approaches to RDF updates often avoid the CRUD approach, and take more direct, but problematic approaches. The ingest of huge datasets using one-off processes such as data-dumps or R2RML. This approach will not scale to frequently updating systems. It might be workable for data warehousing, data analysis or systems with very static data needs, but fast-moving systems with frequent changes are disrupted by large updates. This is particularly so with the majority of triple store implementations, where the ingest of large datasets is an effective block on all other updates. Using RDF change-sets, SPARQL 1.1 update queries or equivalent to alter the state of a triple store in increments. The problem here, is that the process must be treated like a dbdeploy script, each update must be processed in a precise order to a known state. A change-set can corrupt the data if applied before or after it is supposed to be. In practice, this makes the use of this approach for updates brittle and error-prone. One mistake, and you’re in rollback-hell, and managing this across multiple environments, each with differing states, is overly-complex. Which ‘things’ will be chosen as the unit-of-update? Which properties belong to which ‘things’? To be efficient, it is important to update any given property along with the ‘thing’ with which is it most likely to be updated. What is described here is essentially a form of object-graph-mapping, where the ‘object’ is synonymous with the previously discussed ‘thing’. The domain is divided up into a set of object classes, where the data is deterministically assigned to instances of these object classes. To continue with the music example, the domain could be split into artists and compositions, with a property like ‘compose’ connecting artists with compositions, considered part of the composition object. This is because, the most likely update scenario is that a new composition is added to the database, with the artist assigned when the composition is added. A less likely scenario is that all the compositions an artist produced will be added or updated along with the artists’ basic information like name and date of birth. Clearly this will sometimes be a subjective decision. The advantages above show that this approach solves the problems with both the heavy-weight and fine-grained approaches. What would an object update feed look like? 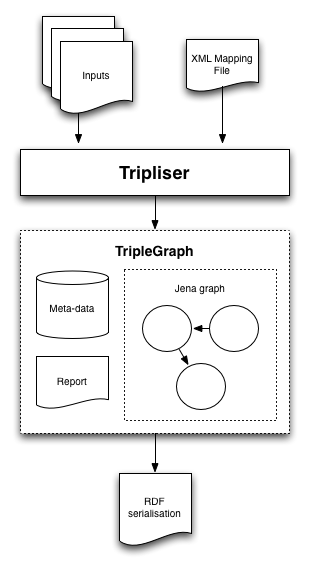 As indicated in the disadvantages above, in order to update an object, it is necessary to know exactly which triple need to be removed – the triples that describe the previous version of the object. I have seen two approaches here, the first is to use a SPARQL query to pull in the triples for removal. This approach is just as brittle at the fine-grained approach, so I would not recommend it. A better alternative is to use context or named graphs – where each object resides in its own context, which can be removed on update. I am of the opinion that context should be used exclusively for data management within a triple store. But perhaps I will leave that discussion for a later post.